The Academy of Medical Sciences has worked to outline the benefits of stratified approaches to medicine, and to address barriers to their widespread development and adoption. ‘Stratified medicine’ is the grouping of patients based on risk of disease or response to therapy by using diagnostic tests or techniques. Patients and healthcare providers both benefit from more targeted and effective treatments, whereas industry benefits from the potential for more efficient therapeutic development as well as the market expansion for these new treatments. These benefits were outlined in the Academy of Medical Sciences' 2007 FORUM symposium report, ‘Optimizing stratified medicines R&D: addressing scientific and economic issues’, which also identified several challenges for the development and adoption of stratified medicine. These challenges – in the areas of regulation, health economics and clinical and research infrastructure – had not been adequately addressed in the five years to 2012. To ensure these barriers do not persist for a further five years, the Academy initiated work to identify the ongoing challenges and to propose solutions for the development and use of stratified medicine products, namely targeted drugs and their associated diagnostic tests. 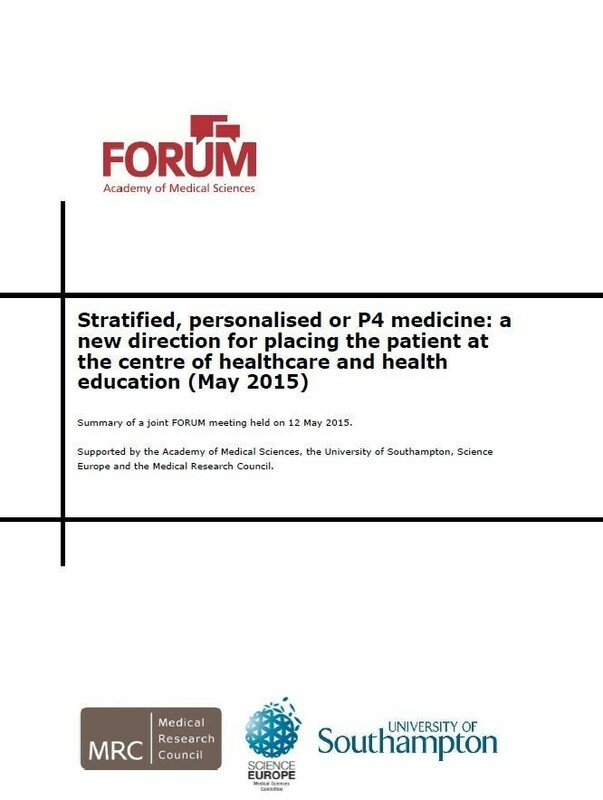 This project resulted in the 2013 report ‘Realising the potential of stratified medicine’. The Academy released a short film to celebrate the launch of the report. On November 8 2013, the Academy hosted a follow-up meeting to discuss the implementation of the report‘s recommendations. The meeting brought together key stakeholders to consider relevant plans, progress and opportunities for action, including the identification of short-term gains and long-term goals. A summary note of this meeting is available for download. 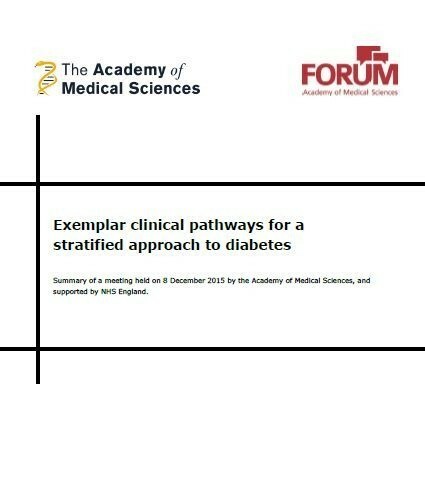 Following on from the 2013 report, the Academy recently convened a FORUM symposium in May 2015, together with the Medical Research Council, Science Europe and the University of Southampton, to discuss the ongoing challenges with implementation of stratified medicine. The symposium on 'Stratified, personalised or P4 medicine' highlighted several key challenges to be addressed if the potential of P4 medicine is to be realised. Further information can be found under the '2015 symposium' tab and the meeting report can be downloaded from the righthand side of this page. 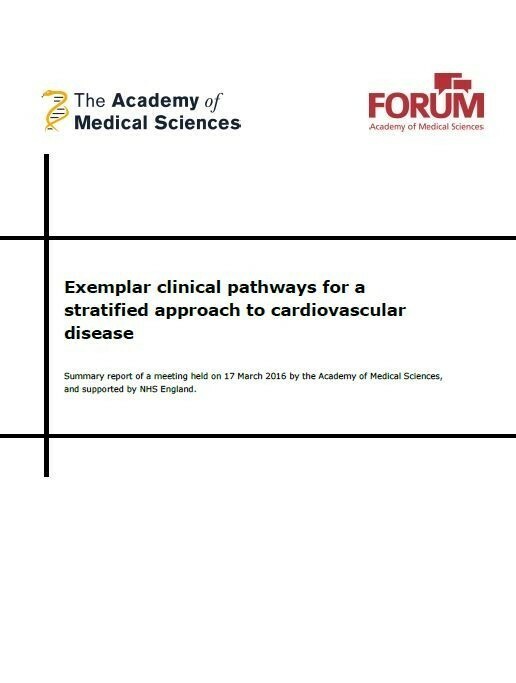 From 2015-2017, the Academy hosted four roundtables examining the clinical pathways for stratified medicine in four therapy areas; cardiovascular disease, diabetes, severe asthma and psychiatry. The common themes from these roundtable meetings are now being explored further by the Academy for future policy work. The Academy, in partnership with NHS England, has organised a series of FORUM roundtables to explore exemplar clinical pathways for a stratified approach in particular disease areas in the NHS. To date, these roundtables have brought together representatives from across the healthcare sector including commissioning bodies, clinicians, charities, academia and industry, and the discussions from these events will feed directly into NHS England's Personalised Medicine Strategy as well as the Academy's work in this area. Alignment of the diagnostics and therapeutics pathways. Commissioning and funding frameworks for diagnostics. A systematic approach to stratification. Integration of services along the pathway. Health economics and the strengths and weaknesses of the current evidence base on clinical- and cost-effectiveness. The reports from all four meetings have now been published and can be found on the right hand side of this page. If you would like to discuss these events further then please email forum@acmedsci.ac.uk. The Academy of Medical Sciences’ FORUM was established in 2003 to catalyse connections across industry, academia and the healthcare sector. Since then, a range of FORUM activities and events have brought together researchers, research funders and research users from across academia, industry, government, and the charity, healthcare and regulatory sectors. Further information and details of future events can be found on the FORUM homepage. The animation below was developed alongside the 2015 FORUM meeting report on 'Stratified, personalised or P4 medicine'. The animation provides an overview of P4 medicine as well as outlining some of the key themes from the 2015 meeting report. You can also watch the animation on Youtube. Following on from the Academy’s 2013 report ‘Realising the potential of stratified medicine’, the Academy convened a one day symposium to discuss the ongoing challenges of implementation of stratified medicines in the healthcare setting. Consider how the concept of stratified medicines can be applied across the spectrum of diseases, from cancer to rare diseases. Examine the issues of implementing stratified medicine in healthcare settings. Look to the future in preparing the healthcare community to embrace this new approach to therapy, including its incorporation into medical education. The meeting saw over 100 delegates from across Europe – spanning academia, industry, healthcare providers, regulatory and funding bodies – explore the barriers to implementing this evolving approach, and recent developments in data integration and informatics, capacity building, diagnostic development and education. The meeting featured presentations by the 100,000 Genomes project, the Farr Institute in Scotland and the EU IMI initiative, among others (please see the meeting programme for a detailed list of presentations). A series of posters highlighting work by the MRC Stratified Medicine Consortia and by clinicians and academics from the University of Southampton and University Hospital Southampton were also on display. Better incentivise and reward the development of this approach. Further integrate and share information and knowledge. More closely align medical education and training to the needs of the modern healthcare system. Encourage and ensure societal acceptance of emerging technologies and approaches. The speakers' slides and meeting report are available to download from the righthand side of this page. This symposium was part of the Academy of Medical Sciences’ FORUM programme of events. The Academy’s FORUM was established in 2003 to recognise the role of industry in medical research, and to catalyse connections across industry and academia. Since then, a range of FORUM activities and events have brought together researchers, research funders and research users from across academia, industry, government, and the charity, healthcare and regulatory sectors. Further information and details of future events can be found on the FORUM homepage. 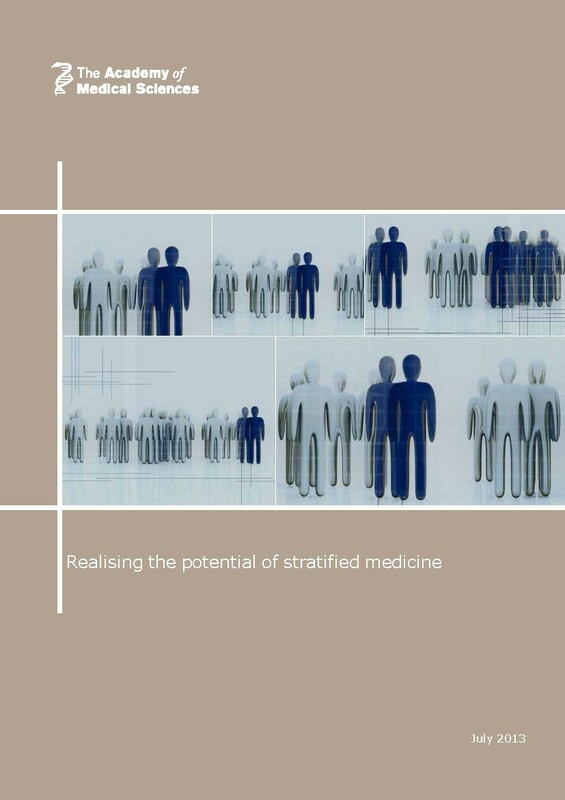 The 'Realising the potential of stratified medicine' report arose from a project that followed on from the Academy’s 2007 report, undertaken to facilitate progress in stratified medicine research and development, and the implementation of these approaches in healthcare services. The project focused on identifying solutions to the ongoing barriers in clinical and research infrastructure, regulation and pricing and reimbursement. To discuss the issues at an October 2012 symposium, the project brought together experts from the pharmaceutical and diagnostic industries, health economists, medicines regulators, health service providers, clinical researchers and policy makers in the private and public sectors. 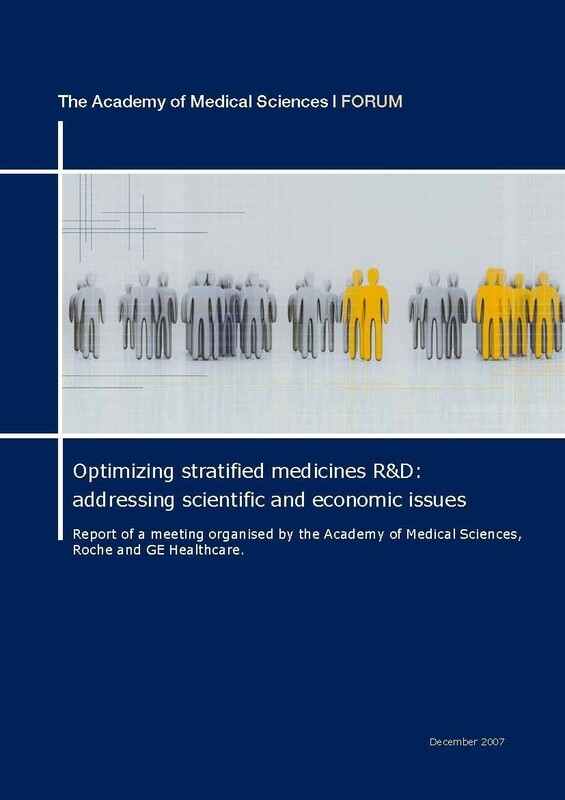 The report draws on the following: the four discussion papers prepared for the symposium, which defined challenges and suggested solutions; discussions at the symposium; case studies, which set out the drug and/or diagnostic development pathways used by industry and drew out the lessons learnt; and the expertise of the oversight group. It tackles global issues, but because members of the preparatory groups and symposium attendees were mostly from the UK, does so largely from a UK and European perspective. Collaboration will be crucial to accelerate the development and adoption of stratified medicine. The project informed the Academy's response to the Medicine and Healthcare product Regulatory Agency (MHRA) public consultation on the revision of European legislation on medical devices and in vitro diagnostics, and our ongoing engagement with the MHRA regarding this legislation. The two health economist members of the Oversight Group have subsequently published a book chapter related to the issues considered in this project. Garrison LP & Towse A (2014). Economics of personalized medicine: pricing and reimbursement policies as a potential barrier to development and adoption. In Culyer AJ (2014). Encyclopedia of Health Economics. Elsevier, San Diego. The Academy is grateful for the support of Amgen, the Association of the British Pharmaceutical Industry, GE Healthcare, the Medical Research Council, the Medicines and Healthcare products Regulatory Agency, Roche and the Technology Strategy Board. The Academy appointed an oversight group to lead the 2013 'Realising the potential of stratified medicine' project. The 2013 report was reviewed by an external panel appointed by the Council of the Academy of Medical Sciences. Reviewers were asked to consider whether the report met the terms of reference, and whether the evidence and arguments presented in the report were sound and supported the conclusions. Reviewers were not asked to endorse the report or its findings.